The first race of the Dubai World Cup Carnival see's the Godolphin Mile and in this Group 2 contest we have two selections with the favourite Muntazah and each way chance with Coal Front. Firstly the Doug Watson trained Muntazah looks to be the one to beat in this contest winning his last two races in good style including A Group 3 over course and distance last time out beating some of these rivals and breaking the course record for this race. The second pick in this race comes from an each way angle is the American raider Coal Front for trainer Todd Pletcher. This five year old has won six out of eight runs on dirt with four of them coming in Graded company, big chance if repeating this form on Saturday. The second race of the meeting comes in the way of the Group 2 Dubai World Cup over 2 miles and in this prestigious contest we have gone for the Melbourne Cup winner Cross Counter. This Charlie Appleby trained gelding had a superb season last year winning really nicely at Goodwood in the Group 3 Gordon Stakes breaking the course record that day. From there he finished his British campaign for the season off with a narrow second at York in the Great Voltigeur. From there he went over to Australia and became the first British horse to ever win the Group 1 Melbourne Cup and that run sets the standard in this race. The first Group 1 of the afternoon see's the Al Quoz Sprint and in this six furlong contest we have gone for the favourite Blue Point owned by Godolphin. This classy sprinter for trainer Charlie Appleby last season won the Group 1 King's Stands Stakes at Royal Ascot beating some classy horses and finished the season with some good place efforts. This year the five year old has picked up from where he left off last season and on both his runs over course and distance he has won them nicely and will take all the beating in this race. The last of our Godolphin owned tips for the meeting and this time it comes in the way of the highly progressive Divine Image in the Group 2 UAE Derby. Another of the Charlie Appleby trained horses that could see the star trainer come away with some great black type victories and this three year old filly has just got better and better with each run. On all her three starts at Meydan this year she has shown a lot of ability and on her latest two starts she has won nicely in Group3 and Listed events to make her the one to beat on Saturday. 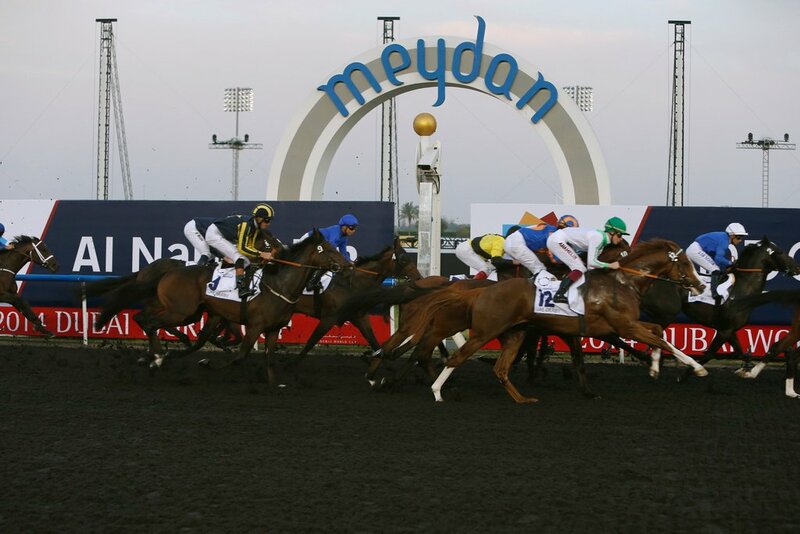 Next up is the Dubai Golden Shaheen Group 1 and this six furlong contest on the Dirt see's our selection X Y Jet have a great chance to land the spoils. This Jorge Navarro trained seven year old holds a lot of experience in these type of races with finishing second in a photo finish back in 2016 and also the same in last year's edition of the contest. This season he has been in decent form over in America winning some nice races and comes into this contest off the back of an easy win in a Claimer at Gulfstream. One of the most exciting races of the meeting see's the Group 1 Dubai Turf contest over 1 mile 1 furlong and we have gone for the unbeaten Almond Eye to extend her unbeaten record. This classy filly is the talk of the flat racing scene outside of Europe with her being talked about as a major threat to the Great Enable's bid for her third Arc at the end of the season. This four year old has raced five times and has beaten her fields emphatically in every run picking up major honours like the Japan Cup and four Group 1s in total. One of the bankers of the meeting to many and a very exciting filly to watch on Saturday. The penultimate contest of the meeting is the Group1 Dubai Sheema Classic where we have steered clear of Godolphin and gone for the Japanese Rey De Oro to land the race. This five year old horse looks to have a great chance off the back of his recent form back in Japan and his decent fourth in this exact race last year. Over in Japan he has figures of 112 in his last three races with his latest win coming in a Grade 1 contest over 1 mile 2 furlong and when stepped up in trip next time out, finished a good second behind a decent three year old. The last race of the meeting is the feature of the day and the esteemed Group 1 that is the Dubai World Cup and in this contest that could see the winner take home $12 million, we fancy Capezzano. This progressive five year old gelding has been in the form of his life this year winning all three of his last races at this track between a mile and 1 mile 2f. His latest victory came in a group 1 over course and distance beating Thunder Snow by a clear distance, who won this race last year. Has to be the form selection of the race.